To ensure the validity of your results from today’s high performance instrumentation, Thermo Fisher offer an extensive range of high quality standards and certified reference materials to meet your requirements. Covering organic, inorganic, environmental, petrochemical, ICP and ICP-MS, pharmaceutical, speciation, food and beverage, pesticides and much more. If you can’t find what you’re looking for, ask about our custom products service. Ajax Finechem offers an extensive product range including ACS grade reagents, high purity acids and solvents for HPLC, GC, Spectroscopy and Pesticide Residue analysis, volumetric solutions, pH buffer solutions ICP & AAS standards, certified ultra pure acids for trace metal analysis and a range of products for specific applications. Ajax brand chemicals are available in a variety of pack sizes and packaging options including glass or plastic bottles and metal or plastic drums. 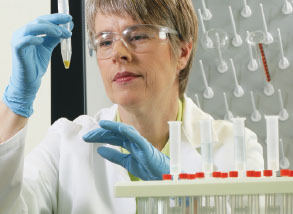 Australian Chemical Reagents are specialist manufacturers of chemical reagents used in laboratories and industry. Their range includes volumetric and buffer solutions, AA/ICP inorganic standards and custom made reagents.